Firefighters were called to the scene of a blaze on Monday. The occupants of several homes were evacuated while firefighters used a combination of water and foam to tackle the blaze. 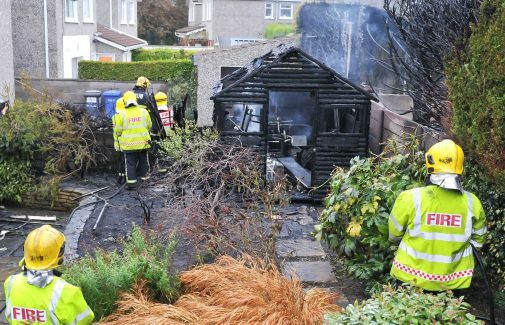 Up to 20 firefighters were involved in the complex operation in Ballincollig, west of Cork city this afternoon, when the storage tank in the back garden of house in the Westcliffe Estate became engulfed in flames and exploded. The alarm was raised at 2.45pm and three units of the fire service – one unit each from the county fire service in Ballincollig and Macroom, and one unit of the city fire service from Anglesea St – responded. They were on the scene quickly but the blaze had spread from the back garden where the tank was, to a neighbouring garden, and into two gardens which back on to them. The oil tank, garden sheds, trees and shrubs across the four gardens were fully ablaze. The flames had also spread to the conservatory of one house and the kitchen of another. The huge plume of smoke could be seen from several miles away. The occupants of several homes were evacuated while firefighters used a combination of water and foam to tackle the blaze. They managed to bring the fire under control within 15 minutes, and prevented it from engulfing the houses. They were expecting to remain on the scene for several hours dampening down the scene. Gardaí are now investigating the cause of the blaze, and will be examining the remains of the oil storage tank in due course.